Florida State Advances To WCWS Championship Series! OKLAHOMA CITY, Okla. — Crushing four home runs and slugging seven of their 10 hits for extra bases, the Seminoles won their sixth elimination game of the 2018 NCAA postseason as No. 6 Florida State (56-12) earned a 12-6 win over No. 3 UCLA (58-7) to advance to the WCWS Championship Series for the first time in school history. Florida State will play No. 5 Washington (52-8) in the best-of-three Championship Series that will begin on Monday, June 4 at 7:00 p.m. ET. Game two will be on June 5 at 8:00 p.m. ET, and the third game (if necessary) will start at 8:30 p.m. ET on June 6. All three games will be broadcast nationally on ESPN. The six elimination game wins for the Seminoles in 2018 ties an NCAA postseason record, matching the performance of UCLA in 1985 and 1997. Jessie Warren led off the top of the first with a single up the middle and Sydney Sherrill nearly matched the NCAA single-season doubles record with a ball toward right center, but UCLA’s Bubba Nickles made a diving catch for the second out of the inning. Anna Shelnutt followed with a single to right, but UCLA’s Rachel Garcia recorded a strikeout to end the inning. UCLA made a pitching change to start the second inning, bringing in Selina Ta’amilo to relieve Garcia and Cali Harrod launched a one-out solo home run to left field to put the Seminoles up 1-0. The inning continued with a double by Morgan Klaevemann and UCLA re-entered Garcia. Elizabeth Mason lined a ground ball to third and a UCLA error kicked the ball into center, allowing Klaevemann to score from second to extend the lead to 2-0 FSU. Warren followed with a two-run home run to center, prompting another pitching change from UCLA to bring in Holly Azevedo. 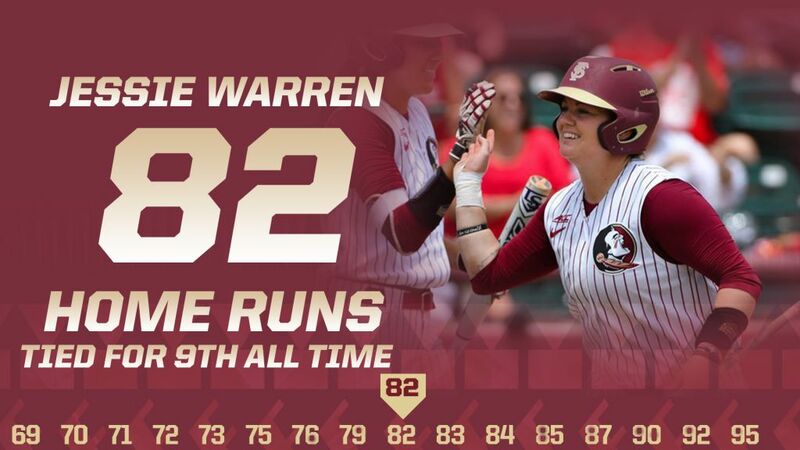 It was Warren’s 82nd career home run, which moved her into a tie with Michigan’s Sierra Romero (2012-15) for ninth in NCAA history. The pair of RBIs increased her career total to 271, passing Auburn’s Kasey Cooper (2014-17) for eighth-most in the history of NCAA softball. The Bruins answered back with a two-out, two-run home run by Taylor Pack in the bottom of the second to cut the lead to 4-2. It marked the first earned runs allowed by the Seminole pitching staff in 23.0 innings, dating back to May 31 against UCLA. Sherrill hit her second HR of the 2018 WCWS in the top of the fourth inning, a three-run HR to break the game open for a 7-2 Seminole lead. Warren hit a two-out single to center and a walk to Carsyn Gordon set the stage for Sherrill to hit her 12th home run of the season to right center. UCLA battled back in the bottom of the fourth getting two more runs on a two-out, two-run single by Pack to make it a 7-4 lead for the Seminoles. The Seminoles broke out for five runs in the top of the fifth, as Morgan started the inning by reaching on a UCLA error and quickly stealing second. An RBI double by Zoe Casas brought her in to score and Korina Rosario entered to pinch run at second. A groundout moved Rosario to third, and she scored on an RBI squeeze bunt by Klaevemann. An intentional walk to Warren with two outs allowed Gordon to make it a 12-4 game with a three-run home run to left. The Bruins avoided the run-rule with a solo home run in the bottom of the fifth by Briana Perez, cutting the Seminole lead to 12-5. After a UCLA single, Cassidy Davis entered to pitch for the Seminoles to replace Kylee Hanson in the circle. Davis handled a groundball and tossed to Harrod at second to begin an inning-ending double play. UCLA added another run on a solo HR by Nickles in the bottom of the sixth. Davis allowed a pair of one-out singles later in the inning, but another double play on a ground ball to Warren at third ended the inning. Meghan King pitched the seventh for the Seminoles and retired all three batters she faced to clinch the 12-6 victory. Hanson (30-4) picked up the win, allowing eight hits and five runs over 4.1 innings with zero walks and two strikeouts. Davis scattered three hits and gave up one run in her 1.2 innings of relief. Links for FSU softball radio and live stats throughout the WCWS Championship Series will be available on the softball schedule page of Seminoles.com.